Are you really surprised at this point? I was so flattered to be included in Kate Ramos’ Margarita Week 2017. If you don’t know Kate – and her gorgeous blog, Hola Jalapeno – you really should. It’s where Kate shares her modern take on authentic, Mexican-inspired recipes, all accompanied by her beautiful photography. So I said “yes” without thinking twice, and then promptly wondered what in the world I would make. I mean, I “like” a margarita every now and then (especially one made with freshly squeezed blood orange juice), but it’s certainly not my go-to drink. Nor do I post many cocktails on this blog in general. Which is when I remembered my margarita cookies, and that I didn’t have to limit myself to strictly beverages. So I toyed around with a few ideas (macarons! energy bars!) and then promptly landed on my go-to SNACK – Muddy Buddies. 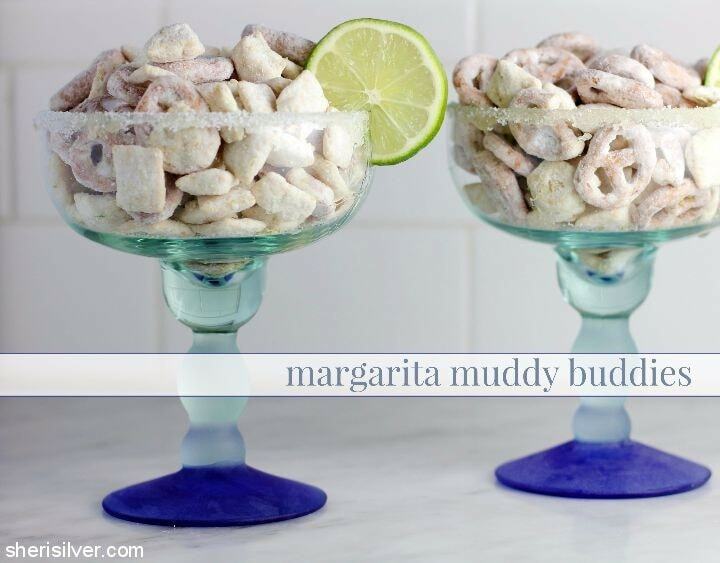 These were such fun, I tell you – and a refreshing departure from the sweet-on-sweet-on-sweet of most Muddy Buddy recipes. I started with the basic components of a margarita – lime and tequila – and had no problem figuring out where they’d go in the recipe. But what about the salt? I considered adding a pinch to the melted chocolate, or sprinkling the flaky stuff over the finished cereal. But I didn’t want it to overpower. 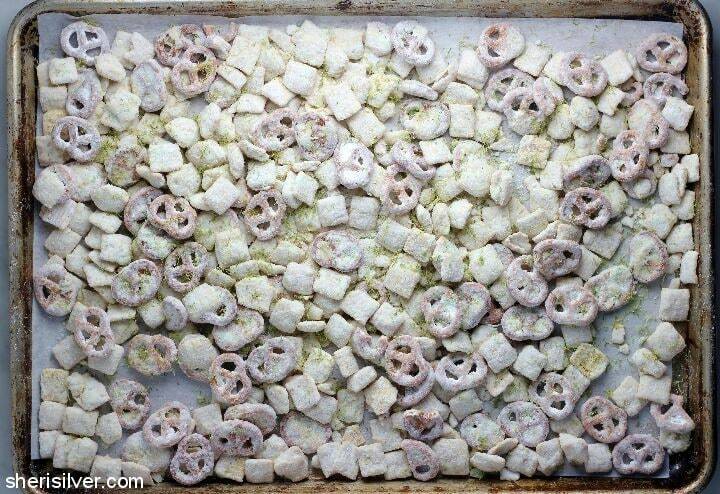 So I took out some of the cereal and replaced it with little pretzel twists. I used a bag of gluten-free twists I happened to have – which keeps the recipe gluten-free. But use what you like. 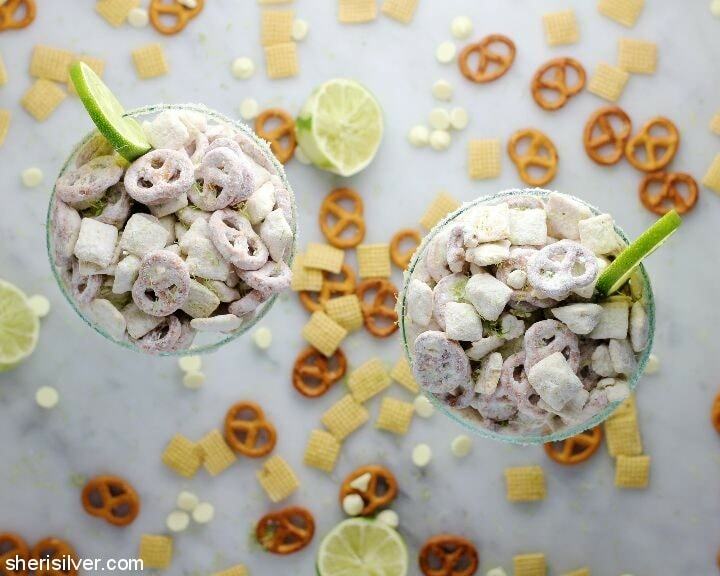 The lime juice and zest are a lovely complement to all that sugar and white chocolate, and the pretzels add just the right amount of salt and crunch. Be sure to hop over to Kate’s blog to check out all of the amazing margarita recipes – alcoholic and otherwise! 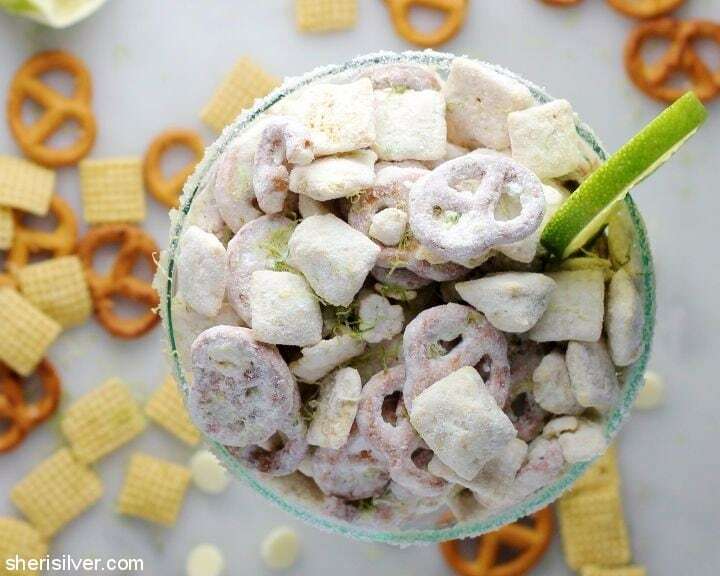 And you can follow along on Instagram too (#margaritaweek). I think this would be such fun to serve at a Cinco de Mayo party, don’t you? Place the confectioner’s sugar in a large ziploc bag. Line a baking sheet with parchment paper. Melt the chocolate chips, butter, lime juice, 1 tablespoon of lime zest and tequila in a large heatproof bowl set over a pan of barely simmering water. Remove bowl from heat and add the cereal and pretzels. 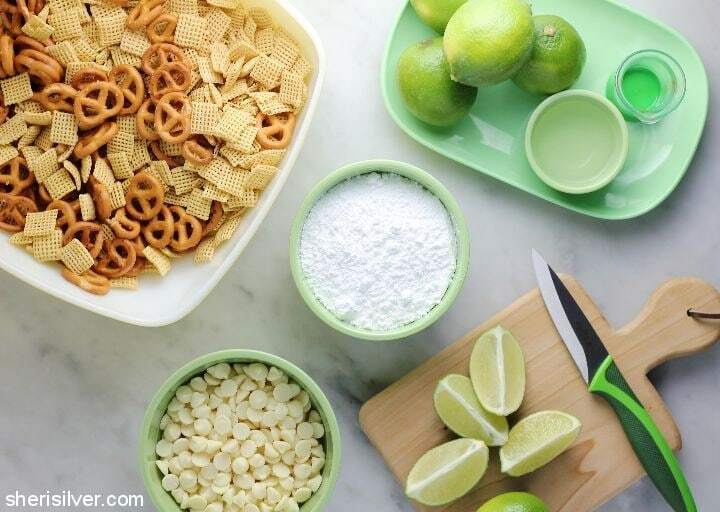 Use a large spoon or rubber spatula to coat the cereal and pretzels evenly. Gently fold in the remaining tablespoon of lime zest. Place the mixture in the bag with the confectioner’s sugar. Seal the bag and gently shake to coat evenly. Spread onto your prepared baking sheet and let set. Store in an airtight container at room temperature. Want even more Muddy Buddies? I see you.